Khabarovsk is one of the most east Russian cities, situated on the board with China, North Korea and the Sea of Japan. RBTH explores what to do and to see in this so Russian but so Asian city. On a map of northern Asia, the vast expanses of Russia appear to blend seamlessly into a mysterious land known as Siberia. But journey to Russia’s most eastern, Pacific region and most locals will say, “You’re not in Siberia anymore. This is the Russian Far East." The distinction isn’t arbitrary. The Far East isn’t like the rest of Russia. The Russian Far East extends north from the port city of Vladivostok all the way to the Bering Strait. From east to west, the Far East spans across four time zones of mountains and taiga forest, over an area nearly as large as Australia. The Far East borders China, North Korea, and The Sea of Japan. Yet despite its closeness to Asia, the Far East is distinctly Russian: old concrete Soviet apartment buildings sprout up from most towns, Baltica is the beer of choice, and the mobile wedding parties Russia is famous for constantly appear along the roadside in summer. Less than seven million Russians actually live in the Far East, making it one of the most sparsely-populated places on earth. Soviet era subsidies that once kept the region alive disappeared and contributed to the rapid population decline. But in the last four years, the Far East has received new investment from Russia, most notably in the cities of Vladivostok and Khabarovsk, to combat China’s growing influence in the region. Whether you’re seeking outdoor adventure, a taste of urban Russia, or a glimpse of the country’s Soviet past, the Far East is a great place to start. Most travelers in the Russian Far East visit the port city of Vladivostok, which serves as the Trans-Siberian Railroad ’s eastern terminus. Regular flights link Vladivostok with Tokyo, Beijing, and Seoul. These same destinations also offer connections to Khabarovsk, Vladivostok’s slightly less-famous rival for the title of the Far East’s most intriguing city, located about 800 kilometers to the north. Alternatively, the Trans-Siberian Railroad connects Vladivostok with Khabarovsk. Five trains leave daily and tickets range from $40-120 depending on what class train you take. Khabarovsk is a slice of Eastern Europe located in north Asia and the region’s most cosmopolitan city. It rests on a several hills overlooking the mighty Amur River, the world’s ninth longest. Standing in Khabarovsk, you can see China across the Amur, which creates a natural border between these two superpowers. At sundown, a blazing Asiatic sun often drifts down over the river, turning the water below to a deep crimson. The dark silhouettes of The Church of the Transfiguration’s golden onion-domes stand tall over the city in stark contrast to the culture of nearby China. Khabarovsk is a great place to base for a few days before traveling further a field. Start a walking tour of the city in Dinamo Park, a pleasant spot for a stroll with lots of trees and several ponds. If you arrive at Khabarovsk’s train station, walk down the hillside along Amursky Boulevard for three blocks and take a left on Ul. Dikopoltseva. From there, it’s a short walk to the park. Dinamo Park is close to many points of interest. The Fedotov Exposition Hall (47 Karla Marksa) has rotating exhibitions of modern art. Across the street is the Theatre of Musical Comedy, (64 Karla Marksa, inside Dinamo Park) the city’s largest concert hall. If you’re traveling with children, take a right off the park’s northern edge on to Ul. Tolstogo and you’ll see the Gaidara Children’s Park which has several small amusement park rides for the young ones. Continue south down Dinamo Park and you’ll arrive at Lenin Square, the city’s main plaza complete with the requisite statue of the former Soviet leader. From Lenin Square, Ul. Muravyov Amursky leads southwest towards the Amur River. It’s one of Khabarovsk’s prettiest streets where many of the oldest tsarist-era buildings are found along with some of the city’s best shopping. For Russian arts and crafts, including Matryoshka dolls, jewelry, and paintings, stop at Hudozhestvennye Salony (15 Muravyov-Amursky), or just next door, Tainy Remesla (17 Muravyov-Amursky), located in the beautiful old House of the Pioneers Duma building. Heading towards the river, both are located on the right hand side of the street. At the end of Ul. Muravyov-Amursky you’ll see the Amur River, nearby China, and the stunning Dormition Cathedral, a tall church with blue towers that looks over Komsomolskaya Square. Take a left on Ul. Turgenev for a closer look at the tall Transfiguration Cathedral and nearby World War II Memorial, but be warned, it’s a steep walk uphill! Both churches were built after the fall of the Soviet Union and are unique examples of modern Russian architecture. Komsomolskaya Square and the surrounding streets are a great place to grab lunch or dinner. Try Chocolate (74 Turgeneva) for international dishes and coffee, Scalini (18 Muravyov-Amurskiy) for Italian, Teplan Yaki (11 Muravyov-Amursky) for sushi, Russky Restaurant (9 Ussuriysky Blvd.) for Russian cuisine and live music, and Café Utyos (15 Shevchenko) for upscale fare with beautiful views of the Amur. From Komsomolskaya Square, head down the stairs toward the river where you’re journey will end at Khabarovsk’s main riverfront beach. On a hot summer day, you’ll find more people catching some rays than swimming, although locals do venture in. A lovely park extends along the beach which also contains some of the city’s best museums. The Regional History Museum (11 Shevchenko) , located in a historic 1894 building of red brick, has displays on native culture and wildlife. The Far Eastern Art Museum (7 Shevchenko) has collections of indigenous art, Russian icons, and Japanese porcelain. The Military Museum (20 Shevchenko) has weapons exhibits, tanks, and memorabilia from Russia’s military past. At night, Ul. Naberezhnaya, a promenade along the Amur, has tents in summer that serve drinks and play music. Back up the hill, Hospital (3B Muravyov-Amurskiy) is a nearby club within walking distance. If you’re searching for a dry night out, try the Triada Pantomime Theater (27 Lenina) . It provides eclectic and, true to its name, often silent entertainment. It’s a good bet if you’re Russian is weak. Khabarovsk is an ideal base for exploring the Far East. The Trans-Siberian Railroad and the Baikal-Amur Mainline (BAM)—the Tran-Siberian’s northern twin—both pass through here. Flights to distant locales in the Far East depart from Khabarovsk regularly. For a true taste of Soviet quirkiness, head to Birobidzhan, capital of the Jewish Autonomous Oblast. This small province of swampland straddling the Chinese border was established by Stalin as a new Jewish homeland in 1934. Jews from across the Soviet Union, and as far away as America, once flocked here. Most of the newcomers left a few years later and today only about two percent of the region’s inhabitants identify as Jewish. Take the Trans-Siberian from Khabarovsk to Birobidzhan ($23-45, 9 daily, 2-3 hours). Birobidzhan is a quiet town, but still worth a visit. For insight into the city’s history, try the Regional Museum (25 Lenina), or Freid (14A Sholom-Aleykhema) the Jewish culture center. Stroll around town and you’ll see images of Menorahs and dreidels painted on the bus stops. Further west on the Trans-Siberian, you arrive at the bustling city of Blagoveshchensk, (one train daily from Khabarovsk, $55-110, 12 hours). Located at the confluence of the Zeya and Amur Rivers, Blagoveshchensk possesses that timeless, relaxing quality of a river city. Across the Amur is the Chinese city of Heihe. At nearly 1.7 million, Heihe is ten times larger than Blagoveshchensk. Most of the city’s riverfront stores are run by Chinese who hawk anything from clothes to automotive parts smuggled into Russia. It’s a unique borderlands environment where Asia and Europe meet. With advance planning, you can easily visit Heihe to get a closer view of the relation between Russia and China. You’ll need to get a Chinese visa at the consulate in Khabarovsk (1 Lenin Stadium) and have a multi-entry Russian tourist visa. For a real adventure, head east from Khabarovsk to Sakhalin Island. You can fly or take a train (one daily, 24 hours, $45-85) to the port city of Vanino and then the daily ferry to Sakhalin’s capital, Yuzhno-Sakhalinsk. Sakhalin is about the size of Austria and definitely off the beaten track. The island has large populations of fur seals, sea lions, and whales who appear offshore. You can go rafting or diving in the summer, skiing or ice fishing in the winter. The island is experiencing an oil boom and rise in prices, posing difficulties for budget travelers. Bring a tent and camping gear if you want to experience Sakhalin on the cheap. Astravel Ecotours out of Moscow can arrange tours. Consider hoping a flight from Khabarovsk to Yakutsk, capital of the Sakha Republic. Known as the coldest city on earth, Yakutsk rests on permafrost that turns to mud in summer. Here you can learn about the Evenks, indigenous people who have traditionally survived by herding reindeer. Yakutia Travel ( contact@yakutiatravel.com ) can arrange tours to observe Evenk life. Perhaps most alluring to travelers in the Far East is the Kamchatka Peninsula, a volcanic track of land that juts out into the cold Pacific. Here you can see geysers, hot springs, and stunning volcanoes which are listed as a UNESCO World Heritage site. You’ll have to fly from Khabarovsk to get in as there are no roads leading to this isolated part of the Far East. The peninsula also boasts excellent salmon and rainbow trout fishing. 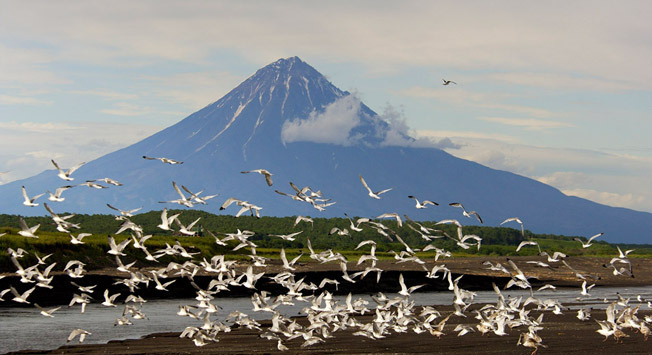 Kamchatka’s Vision ( tour@kamchatka.org.ru ) offers fishing and hiking tours in the region, as does Explore Kamchatka ( info@explorekamchatka.com ).